In recent decades men’s fashion has been largely overshadowed by the frills and frocks presented for the ladies. But with David Beckham and other popular icons embracing male fashion, the cult of the Man is back again to re-define men’s desire to harness dapperhood. The current exhibition in the Asahi room at the British Museum is a nicely timed show. While the West, particularly Britain and France, was once famous for their dashing dandies, Japan during the Edo period was bustling with men in pursuit of the trendiest swagger. In fact, as the West sees yet another surge in the revival of classic menswear, Japan too is experiencing a bit of a boom with more men slipping into kimono. 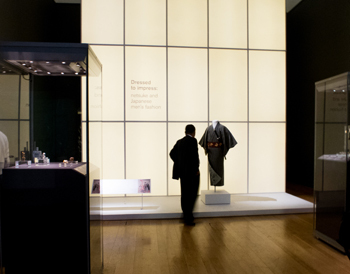 ‘Dress to Impress’ exhibition is an homage to the Edo period observers of refined fashion. Nicole Coolidge Rousmaniere, who is Research Director of the Sainsbury Institute and worked closely on the exhibition says ‘Dressed to Impress exhibition is thrilling because it puts the focus back on men and men’s fashion. In addition it shows how male fashion accessories were used in context, rather than simply showing individual items as works of art. [All items] were part of an ensemble.’ This curatorial pinning is apparent in the small yet carefully formed exhibition. From a collection of ornate netsuke and inrō to decorative swords, the show captures the essence of 18th century townsmen’s fashion in Edo. These men were, according to Nicole, ‘probably some of the most fashionable dressers in the world at that period, despite constant issuance of the government’s sumptuary laws that tried to regulate, among other things, dress and accessories.’ The show is a delightful opportunity to peer into the highly sophisticated fashion culture of the Edo period men and a source of inspiration for those in pursuit of refined material appreciation. The exhibition also coincides with a new publication by Noriko Tsuchiya from the British Museum. ‘Netsuke: 100 miniature masterpieces from Japan’ published by the British Museum Press features perfectly formed examples ofnetsuke. Netsuke are carved toggles. They were essential for a clothing culture not accustomed to pockets. Attached to one end of a silk cord, thenetsuke would be passed through the obi or kimono sash to suspend medicine or seal case (inrō), writing tools, money and tobacco and other personal paraphernalia fastened to the opposite end of the cord. Although netsuke are small in size, they were visible to both the wearer and the observer. The discreet visibility made them particularly popular amongst the merchant class who favored them as means of flaunting their wealth without upsetting the officials. The toggles with wealthy patrons eager to collect some of the best pieces quickly developed into its own art form involving exquisite design, craftsmanship and material. The men would fashion netsuke depending on the season, weather, occasion and their mood. Ranging from still life depictions to scenes from famous tales, mythical figures and peculiar narratives,netsuke captured a complex world in miniature. 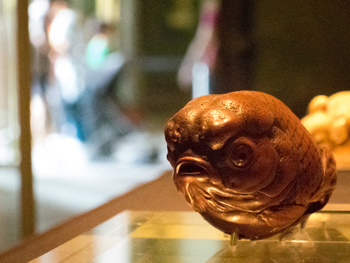 We are delighted to welcome Noriko Tsuchiya and host the Norwich launch of her new publication, Netsuke: 100 miniature masterpieces from Japan on Friday 1 August, 6pm at the Sainsbury Institute.